Out of all Persona games I’ve played so far, Persona 3 remains my favorite. I recall blazing through the PSP version, my eyes glued to the screen even during recess, which was a precious bit of time way back then. I finished the game three times, twice with the male protagonist and once with the female. As you can tell, it’s certainly left its mark on me. 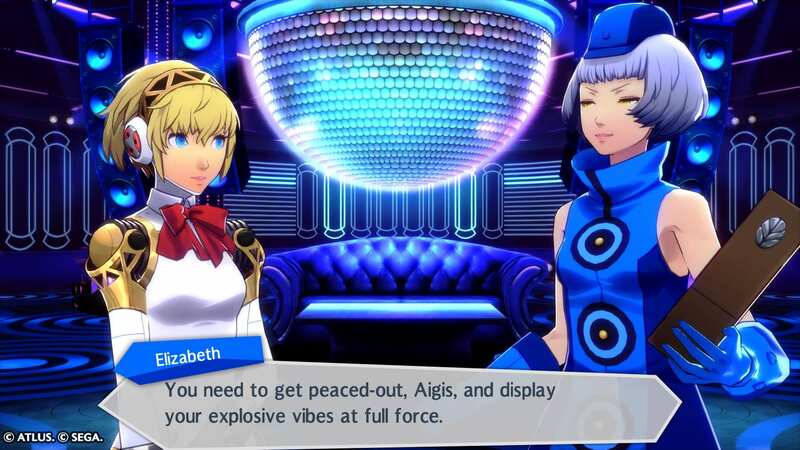 Enter Persona 3: Dancing in Moonlight, a game I’ve been anticipating ever since it was announced. Finally, there’s some content for us starved Persona 3 fans. Those who played the first Persona rhythm game spin-off, Persona 4: Dancing All Night, will find themselves in familiar territory. But there is one key difference: the lack of a dedicated story mode. Instead, we get social links where we can interact with characters we know and love with brief allusions to the main plot of the original game. 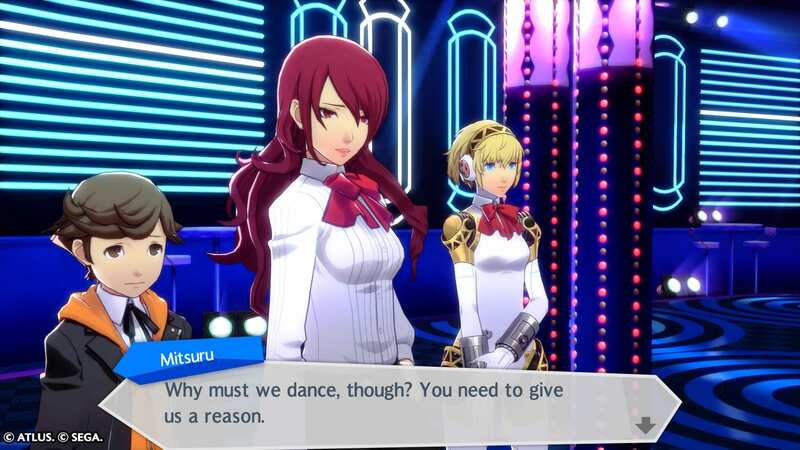 Persona 3: Dancing in Moonlight is definitely a game made for the fans. Almost the entire cast make a reappearance, and conversations between them are peppered with references to Persona 3‘s story without spoiling it for those who haven’t played it. There are pros and cons to this approach, which I’ll detail later. 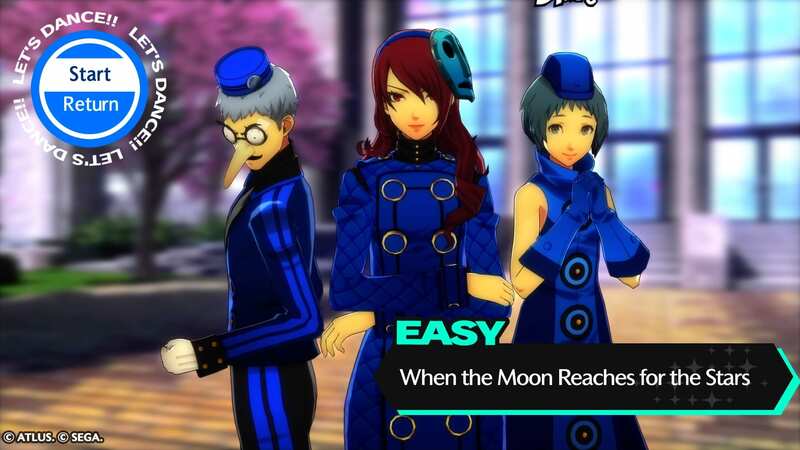 The premise of Persona 3: Dancing in Moonlight is built upon the sibling rivalry between Elizabeth and Lavenza, which means there are references to the other game, Persona 5: Dancing in Starlight. The eccentric sisters decide to have a dance-off to see which of their guests will triumph. It sounds silly, and it is, but I like the over-the-top reasoning which culminates in what is essentially a dance off between two groups of completely different people (the poor unfortunates who are merely swept along for the ride). Elizabeth, the velvet room attendant responsible for a majority of the shenanigans, makes the game far more hilarious than it has any right to be. I haven’t laughed this hard since her antics in Persona 3 Portable. The combined might of voice acting and hammy lines makes the overall atmosphere of the game immensely fun. There is a sense of humor prevalent throughout the game’s writing which I greatly appreciate: Fuuka and Akihiko bouncing ideas off one another to create a lunch menu, Elizabeth poking fun at Igor and his long nose – the list goes on. There is a significant amount of interaction between the cast, none of which I could remember happening in the original game. Many of these moments are unexpected, stemming from this game’s unique version of social links. Social links in Persona 3: Dancing in Moonlight operate in a similar manner as the main games, but err to the side of unlockables, instead of purposely selecting a character to spend time with. For those who are unfamiliar, a social link is the bond between you and another character. There are eight “levels” to unlock, with different conditions for each character. Some are easy, like simply going through tutorials. Others require songs to be completed with challenge modifiers, like speeding up the pace of the button presses. Gameplay-wise, it’s nothing I’ve not seen in other rhythm games. During a song, you hit the directional pad and buttons on your controller when they overlap with their respective symbols. Twirling the analog stick to perform the “scratch” function is optional at the start, but you can tweak the settings in the menu, or reassign it to the shoulder buttons if you desire. There are a total of 25 tracks, and every song can be played in Easy, Normal, Difficult and Nightmare mode. There is a comfortable selection of songs, and the remixes are good, for the most part. I’m pretty satisfied by the song selection, but I wish Atlus chose to add at least five more. Out of the 25, though, two weren’t so great. One was the remix of “Mass Destruction,” which sounded like it was aiming to melt my ears rather than get me pumped up. Leaving behind the signature jazz of the original game, the remixes are mostly electronic in nature, more dance-club than bar-worthy. I was a little irked since I loved the original soundtrack and didn’t want it to be mutilated beyond recognition. But after playing, I have to admit it makes the songs sound fresh. It gives a new breath of life to what might be stale for long-time fans. I wasn’t sure what songs Atlus would pick, but overall, I think the different artists brought on board did great. I couldn’t be happier with seeing my favorite characters dance to their heart’s content with the rhythm. Hearing them shout encouragements while their teammates are dancing is honestly one of the cutest things I’ve encountered. If there is one bone I have to pick with the game, it’s how overdone the character models act during their social links. I understand Atlus might have been aiming for a sense of realism by making each character fidget, turn their heads and fold their arms, but it does the absolute opposite. They overcompensated. It’s like watching a bunch of nervous kids try to talk their way out of trouble with all the constant head nods and hair touching going around. This can be really difficult to get over in the beginning, but the longer I played, the more I got used to the hundred different flavors of fidgeting. Rather than try to make characters more realistic and lifelike, Atlus should consider toning it down. Every movement feels too pronounced and ironically artificial, and makes the game less immersive than it tries to be. Complaints aside, I’d wholeheartedly recommend Persona 3: Dancing in Moonlight to fans of the original game. The character interactions and song selections took me back, and I remembered why I loved this game so dearly. It took me around eight hours to unlock most of the social links, and while that doesn’t sound like a lot, the experience itself is well worth the money. For those who haven’t played Persona 3 however, it’s hard to justify the price and the length. This feels very much like a love letter to the fans of the original, and there’s plenty of subtle nods and jokes that might go over your head. But if you’re just looking to enjoy some great songs and love rhythm games, this might be up your alley. 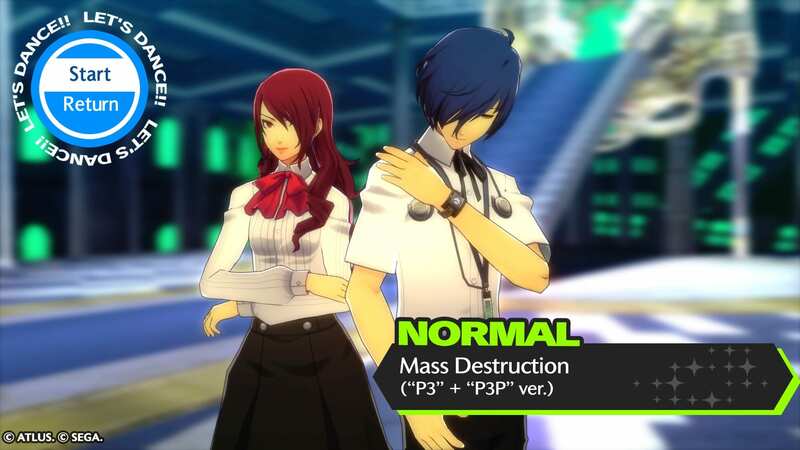 Tow reviewed Persona 3: Dancing in Moonlight using a personally purchased copy. The screenshots in this review were captured by the author on his PS4.